Indeed it is. I like the dividers, as my chest freezers suffer from periodic avalanches when I'm excavating for stuff. Where'd you find them? I am right back to square one again. I don’t know how it happens but it does. My freezer is so chockablock full that it might as well be empty for all the use I can give it. Even the thought of opening it gives me the vapors. I have six days of quiet solitude ahead of me. I’m hoping I can at least determine what is in there. I am hanging my head in shame. Oh my, I found someone who has more frozen food than me. I, too, have an upstairs and downstairs freezer, filled to the brim. I could probably fill a third. My place is the place-to-be in case of a zombie apocalypse. i now have a good grasp of what needs to be eaten and what should be planted for storing this fall. Less tomatoes seeing I have around 20 bags left and have given away at least that many. i am amazed at how well double wrapped freezer paper preserves meat. I found some lamb from two years ago and it was fine, no freezer burn whatsoever. At least on par with vac sealed meat. amazing. I had been plugging away at the freezer and doing well at not adding stuff, until I happened on hams at Aldi for 99 cents a pound. So I bought two. One is in the fridge to be cooked for Easter; the other, of course, went in the freezer. We are going to the beach in July for a family vacay, and I am already planning on sous viding some steaks and freezing in the bags and taking along to have steak night one night. I may bake the ham and take it to make lunches off of that week. Freezers are good BUT, one needs restraint. easy for me to say after clearing stuff out. but I do not want to feel the need to do that again. My head is hanging in shame as well. I see no way out. The blue dividers came with that freezer. There are three baskets also, not shown. The dividers are very high so you can pile a lot of stuff in each section. My new freezer came with dinkie 10 inch high dividers which are useless. I had to buy the plastic bins in order to get things organized and they are stacked two deep. I bought freezer tape so I won't be dealing with mysteries on ice any more (AKA, defrosting something only to find it wasn't what you had expected). That's a step in the right direction. Plus, having eaten a lot of the frozen unknowns over the recent spate of snowstorms, I'm going in to non-replenishing mode. I thought freezer tape was for keeping packages from tumbling to the floor when the door was opened. So I’ve started again. I am challenging myself again to cook my way through my freezer. I spent much of the morning attempting to at least organize it. I tossed out many outdated packages, quite a few GOKs, and carefully inventoried what was left. I still have about half a drawer to go and will try to get to that tomorrow morning. I found a package of dumplings and decided I would start by reheating those for dinner tonight. 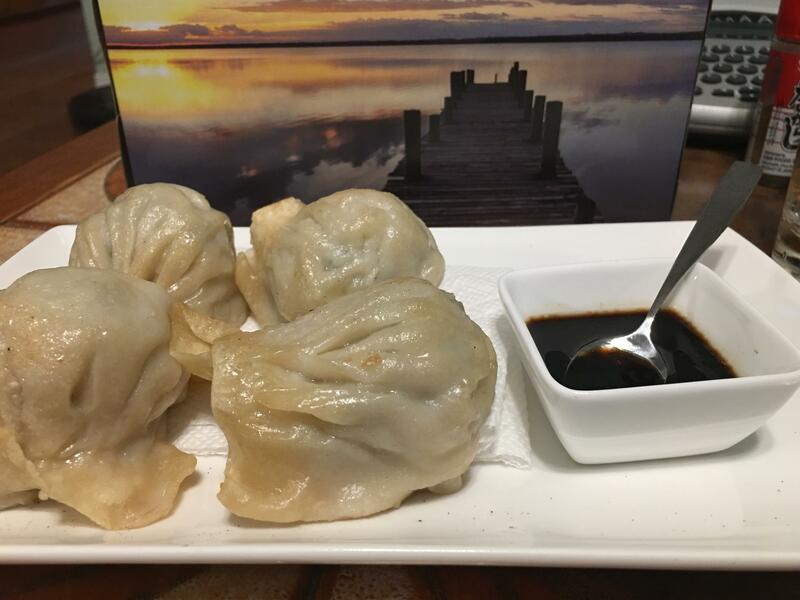 These were Chinese takeout dumplings. I must’ve put them in the freezer to avoid putting them in the garbage can. As soon as I tasted one I remembered how awful they were. A few months in the freezer had not remedied that one iota. 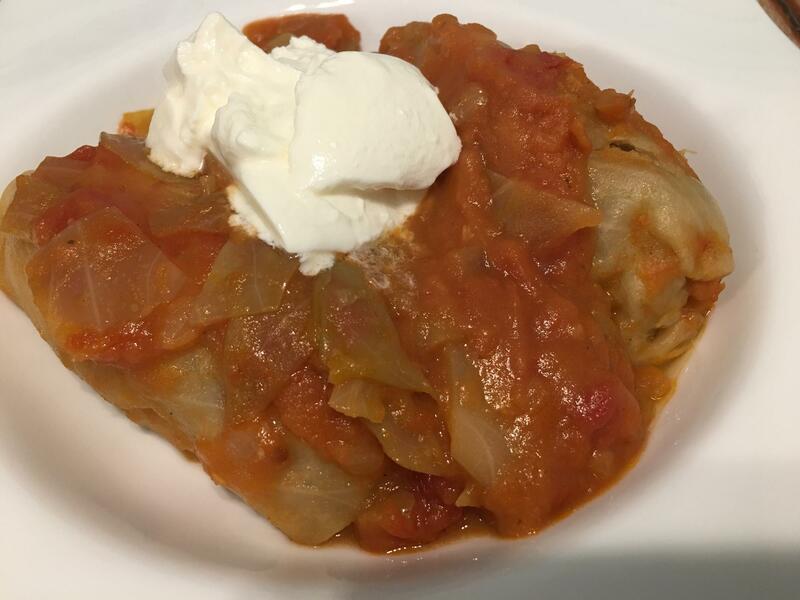 Well the dumplings may have been a disaster but if there’s one thing that freezes brilliantly it is cabbage rolls. There are two cabbage rolls here and I reheated them from frozen in the Cuisinart steam oven for about 35 minutes on the steam bake function at 250°F. A little sour cream hit spot. I couldn’t manage both of them so one has been returned to the refrigerator for later. If someone were to ask me what they could make for me to fill my freezer I swear it would be cabbage rolls. But wait – – – I’m trying to empty my freezer! Does it count that I got out two packages of corn for the corn casserole for Easter dinner? Just curious, does your brother feed his dogs Darwin's Raw Pet Food or does he make his own? Took out two chuck eye roasts and cooked them both. One was returned to the freezer. Had lunch today with friends at our local favorite diner where the conversation turned to meatloaf. It left me craving meatloaf and since the weather for the rest of the week includes snow mixed with rain It lends itself to meatloaf and meatloaf sandwiches. Coming home I dug through the big freezer out in the garage looking for the package of meatloaf mix I know is in there. I couldn't find it! The biggest reason my freezers are so full, I can never find anything so I go buy more! Now what do I do? I will try again tomorrow. Then I’ll have to buy more. At my suggestion he bought a meat grinder and makes his own otherwise it is quite costly to feed a 60 lb doggie. They add other stuff. 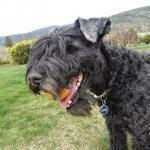 The reason for the raw diet is allergies so they are slowly introducing more variety. Get yourself some larger plastic tubs with lids so you can stack them in the freezer. Label the lids numerically. Take everything out of the freezer and sort into categories that work for you. Ie, beef, lamb, poultry, premade food, etc. Make a list of what and the number bin it is in. Make this into a spread sheet. Use different collars for each bin. If you have an upright you can do the same thing with smalller baskets, numbers and colour coding. then try to be Religious about marking the ins and outs. now is a good time if the weather is lousy and cool. this works very well for me.. Obviously I made omissions, etc., but generally speaking I was able to empty a freezer’s worth of food from three freezers because I knew what I had and where it was. Yup. That explains part of my problem too. But I also tend to freeze leftovers of something I didn’t like in the first place. Go figure. They are never going to leave the freezer except to make their way into the compost heap. Yesterday, while rooting in the inside upright freezer looking for some hamburger, I finally found the meatloaf mix!!! I'd been looking in the freezer that's in the garage. I had already made my meatloaf, though, since when I was searching for that package I came across packages of gr. beef, gr. pork, and gr. veal so I thawed those and made my meatloaf from that. The package of veal was a little big so the meatloaf isn't the best; it would've been better with more beef. But it's good enough and makes quite good sandwiches with my homemade sourdough bread. No one would ever think of me as a hoarder.....unless they looked in my freezers. So my husband told me 'You have to get a handle on the freezer situtation'. I have refilled them all since our January storm. Attempting a shopping ban. My kid is sick and wanted pizza. So while I was looking for the Pork Tenderloin I know I have (it's still lost) for my husbands meal, I grabbed some frozen dough, bacon and pizza sauce for the little ones tea. Long story short. The dough was actually from a really bad batch of Na'an failure and the Pizza sauce was actually a really spicy Marinara for my husbands meals. The bacon, fortunately, was bacon. But it was not good. And I really need to label things.